Good luck to KWL and FS tomorrow! One year ago, it was the eve of the Brooklyn Half marathon, the biggest race that I've ever entered. I'd trained hard for this half and followed a modified version of the Hal Higdon plan. I did progressively longer base runs every weekend and managed to fit in speed workouts every week. Except for the fact that I'd taken on a consulting engagement that caused me to drop my weekly mileage from 24 to 16 for the last two weeks, I'd felt prepared. I ended up having a tough race and wound up in the medical tent after I'd finished. There was nothing I could blame it on. I wasn't injured and the follow up I did with my doctor (including a stress test) revealed no health issues. So far, I've run one good half marathon and two disappointing ones. I may not be built for that distance. Perhaps I should stick to 5 and 10Ks. 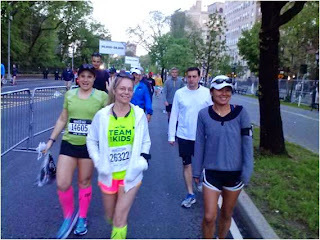 I did have a great time with my friends and the experience of running a big NYRR race was not lost on me. When I think about my disappointing performance, I try to keep in mind that I held a competitive pace (for me) for the first 5K. My race went off the rails once we left Prospect Park, but the final minutes running to the finish line along the Coney Island boardwalk will remain an indelible memory. One year later, the idea of running a half marathon is more of an abstract concept. The long winter and my ruptured disc kept me off the roads through much of the first three months of the year. The elliptical and treadmill sessions I did to maintain my fitness took a toll on my base conditioning. And as we runners know, when preparing for long distance racing, it's all about the base. Even though I haven't done a run over five miles since New Year's day, I've seen great improvement with my injury recovery and I'm preparing to do at least one 4+ mile run this weekend. Today was a work from home day and I only intended to run about 3 miles before settling into business mode. I ended up going almost half a mile longer. While it wasn't a fast run, it felt a lot more natural than it did last week. My running goals one year ago are much different than they are today. Racing is still on the table, but it will be a few months until I'll be able to maintain a competitive pace throughout an entire 10K. I saw an announcement that the Dirty Sock race will be run for the 10th time in August. I've had great experiences running that race, but it's a tough trail run. I may be better off targeting Cow Harbor in September for my return to the starting line. I just need to be careful that I don't push too hard and set back my recovery progress.